It’s no secret that I absolutely LOVE shoes! And now, I’m completely obsessed with any shoe that laces up. So far, within the last few months, I’ve purchased 3 pair…and counting ☺️. And I just love the look. They look awesome with just about anything. Today I’m wearing the ones on the top left with a cute little shift dress. Shoe girl myself! Huge fan of lace up ones also. In fact, it’s a great time to shop for these because the season is changing and pretty soon *(if not already) Fall shoes are going on display. I just racked up a few pair from Dillards. They had $100+shoes for $30!!! I couldn’t resist. 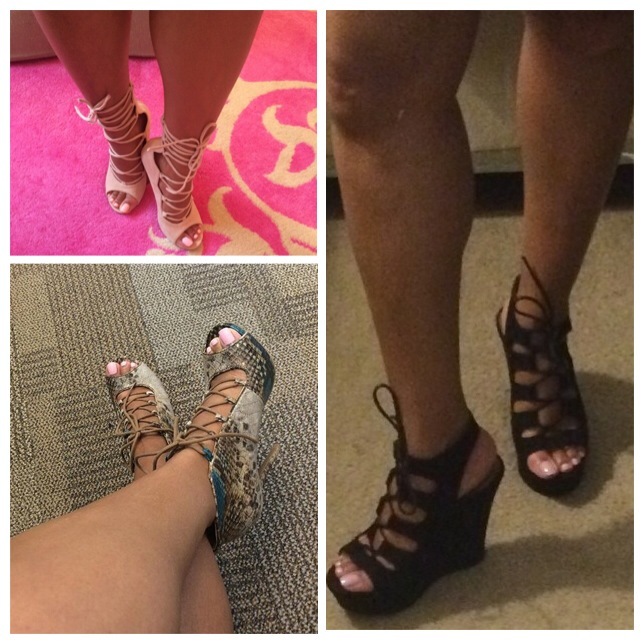 Plus, I also look online for heels that are on Clearance now-due to the seasonal change. Love your taste-you a true FASHIONISTA!!! Awww thanks ☺️ and you are so right, now’s a great time to shop the clearance! I just ordered 2 pair from heels.com, they have BOGO on clearance so I got both for $37! And I’ll have to check out Dillard’s!! !